Do you want to reach enough and lacking some ways to get rich. 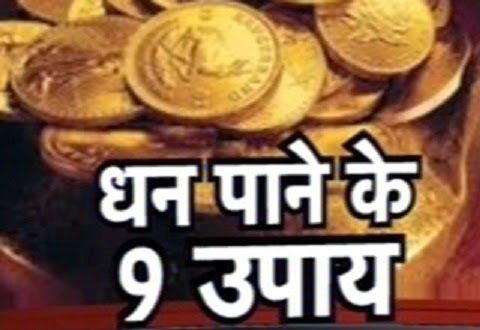 Here is 9 effective ways you can rich in fastest way. The worship is uncompleted without urn. Urn takes on the Amrita. You can establish and worship Laxmi urn for the more money. You have to do “Om Indray Namah” whole day when you establish this urn. You can also do fast or eat only fruits on that day. In evening, you have to do light of ghee in front of Goddess Laxmi and offer flowers. You can take urn of dust or copper and filled it with Gangajal. Deep one coin and add akshat, flower and do panch pallav. You have to keep coconut above the urn and worship Laxmi and cover the urn with red cloth. You have to dainty of Kheer. You have to do “Om Shri Hrim Ae Kamalvashini Swaha” for 5 times. During this mala you have to seat on red color bench and do this mala with Kamalgata. Shakti urn is for Goddess Durga. You can establish and worship this urn to get jewellery. You have to do “Om Rudaray Namah” whole day. You can also do fast or eat only fruits on that day. In evening, you have to do light of ghee in front of Goddess Durga and offer flowers. You can take urn of dust or copper and filled it with Gangajal. Deep one coin and add akshat, flower and do panch pallav. You have to keep coconut above the urn and worship Durga and cover the urn with red cloth. You have to dainty of Panchmevo. You have to do “Om Shri Manidwip Niwashini Swaha” for 5 times. During this mala you have to seat on black color bench and do this mala with Rakatchandan. You can establish and worship Shiva urn to get debt. You have to do “Om Namah Sivay” whole day when you establish this urn. You can also do fast or eat only fruits on that day. In evening, you have to do light of ghee in front of Shivaling and offer flowers. You can take urn of dust or copper and filled it with Gangajal. Deep one coin and add akshat, flower and do panch pallav. You have to keep coconut above the urn and worship Laxmi and cover the urn with red cloth. You have to dainty of Jaggery. You have to do “Om Rom Kauleswaray Namah” for 3 times. During this mala you have to seat on red color bench and do this mala with Rudraksh. You can establish and worship Hanumant urn to settle your business. You have to do “Om Hum Hanumataye Namah” whole day when you establish this urn. You can also do fast or eat only fruits on that day. In evening, you have to do light of ghee in front of Ramayana and offer flowers. You can take urn of dust or copper and filled it with Gangajal. Deep one coin and add akshat, flower and do panch pallav. You have to keep coconut above the urn and worship Hanuman and cover the urn with red cloth. You have to dainty of Ladu. You have to do “Om Vajre Vajray Vajre Namah” for half an hour. During this mala you have to seat on red color bench. You can establish and worship Parvati urn to get rid of debt. You have to do “Om Akarshini Swaha” whole day when you establish this urn. You can also do fast or eat only fruits on that day. In evening, you have to do light of ghee in front of Parvati and offer flowers. You can take urn of dust or copper and filled it with Gangajal. Deep one coin and add akshat, flower and do panch pallav. You have to keep coconut above the urn and worship Laxmi and cover the urn with red cloth. You have to dainty of fruits. You have to do “Om Kale Chandra Kale Namah” for 4 times. During this mala you have to seat on yellow color bench and do this mala with pearl or Rudraksh. You can establish and worship Surya urn to save the money. You have to do “Om Aditya Swaha” whole day when you establish this urn. You can also do fast or eat only fruits on that day. In evening, you have to do light of ghee in front of Sun and offer flowers. You can take urn of dust or copper and filled it with Gangajal. Deep one coin and add akshat, flower and do panch pallav. You have to keep coconut above the urn and worship Laxmi and cover the urn with red cloth. You have to dainty of Sweets. You have to do “Om Sam Suraya Namah” for 3 times. During this mala you have to seat on red color bench and do this mala with Sphatik or Rudraksh. You can establish and worship Vishnu urn to get more earning option. You have to do “Om Keshway Namah” whole day when you establish this urn. You can also do fast or eat only fruits on that day. In evening, you have to do light of ghee in front of Vishnu and offer flowers. You can take urn of dust or copper and filled it with Gangajal. Deep one coin and add akshat, flower and do panch pallav. You have to keep coconut above the urn and worship Vishnu and cover the urn with red cloth. You have to dainty of Mevo and fruits. You have to do “Om Shrim Hrim Soh Laxmipataye Namah” for 3 times. During this mala you have to seat on yellow color bench and do this mala with Sphatik or Rudraksh. You can establish and worship Sarswati urn for the knowledge and earning money by knowledge. You have to do “Aem Sarswatey Namah” whole day when you establish this urn. You can also do fast or eat only fruits on that day. In evening, you have to do light of ghee in front of Goddess Sarswati and offer flowers. You can take urn of dust or copper and filled it with Gangajal. Deep one coin and add akshat, flower and do panch pallav. You have to keep coconut above the urn and worship Sarswati and cover the urn with red cloth. You have to dainty of fruits. You have to do “Om Shri Hrim Aem Shri Hrim Sarswatey Namah” for 3 times. During this mala you have to seat on yellow color bench and do this mala with Sphatik. You can establish and worship Bhairav urn to earn money by hard work and farming. You have to do “Om Bhairaway Swaha” whole day when you establish this urn. You can also do fast or eat only fruits on that day. In evening, you have to do light of ghee in front of Bhairav and offer flowers. You can take urn of dust or copper and filled it with Gangajal. Deep one coin and add akshat, flower and do panch pallav. You have to keep coconut above the urn and worship Bhairav and cover the urn with red cloth. You have to dainty of sweet chapatti. You have to do “Om Unmatay Ruru Bhairaway Namah” for 5 times. During this mala you have to seat on blue color bench and do this mala with Hakik or Rudraksh.